Creamy cake like parfait with crunchy bites this dessert is healthy and protein rich to be indulged guilt free. 1. In saucepan combine milk, semolina flour, chia seeds, maple syrup, vanilla extract and bring it to a boil. 2. At the first boil turn off the flame and let the semolina porridge cool down to room temperature. 3. In the meantime combine blueberries and the rest of the maple syrup in a mixing bowl. 4. 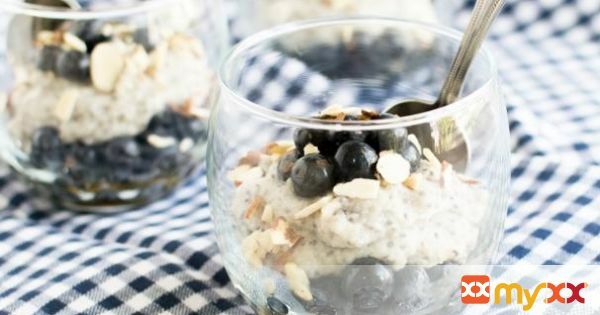 In the serving glasses add the first layer of soaked blueberries, top another layer of semolina porridge, add another layer of soaked blueberries and garnish with slivered almonds. 5. Put them in the refrigerator until ready to serve.